Summer hiatus may have stolen the GLEE from our television screens, but the news keeps streaming in. After yesterday's staggering 19 Emmy nominations, creator Ryan Murphy is keeping the momentum high by announcing a new Britney Spears themed episode. The pop princess had lobbied the show and fans to create the episode using her Twitter account, and like all things social media, the web really paid off. ET revealed, "While there's no word if the pop princess herself will appear on the hit show, "Glee" creator/writer Ryan Murphy tells ET that the show is currently in the middle of writing a Spears episode. The hit show... will also air a big tribute episode after next year's Super Bowl, but Murphy didn't reveal which star it will be based on, only hinting that we were "close" by guessing Michael Jackson." While I doubt that Spears will actually be brought in for a cameo, I'm guessing that they'll use the episode to showcase another Brittany. Actress Heather Morris, who plays dimwit Brittany on the show, is hopefully going to make her first solo-starring appearance as Ms. Spears herself. Morris is a professional dancer and is said to have a wicked voice. 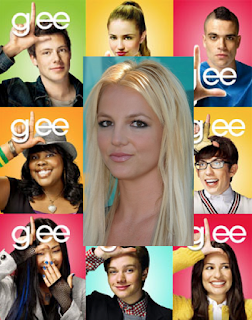 Wouldn't Brittany on Britney be awesome?